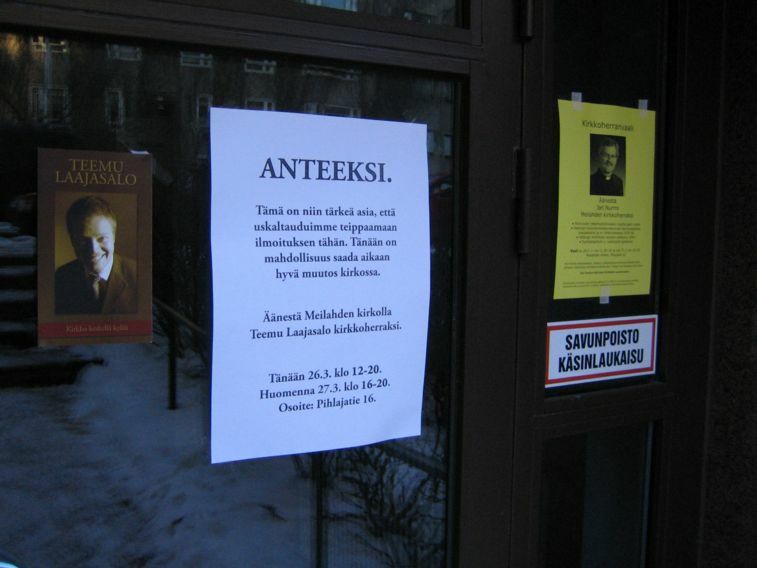 On Thursday, if I recall correctly, an A4-sized advertisement for one candidate (Jari Nurmi) appeared on the bulletin board of the building where I live. I wasn’t particularly offended by the advertisement making its way inside the house, but the advertisement didn’t make me want to vote for that guy, either. I mainly considered the advertisement amusing, because I thought the list of desirable qualities was missing the point. The last bullet point says he has an excellent singing voice. It is noteworthy in a good way that the advertisement says who wrote it. On Saturday I went shopping for groceries and I saw more ads for Jari Nurmi—this time attached to phone (or electricity?) switching cabinets on the side of the street. I didn’t have a camera with me but the ad wasn’t exactly the same and I’m pretty sure it wasn’t signed like the ad on the bulletin board. This time I was a bit offended by the ads. Attaching ads to the phone cabinets is forbidden. Surely it’s a bad idea for an election campaign for a local office to litter the neighborhood. Still, the number of and placement (even if prohibited) advertisements was within somehow reasonable limits. It was still similar to the level of prohibited advertising during the parliamentary elections. I left home around noon on Sunday. When I came back, I decided to take a long walk instead of taking the bus. When I was a few blocks away from home, I noticed color-printed flyers of another candidate—Teemu Laajasalo—attached to bus stops. (Obviously, this is prohibited as well, because the corporation that runs the bus stop ad business doesn’t want others to use their real estate for unpaid ads.) I even saw a flyer attached to a door of an apartment building and the flyer had next to it an A3-sized poster apologizing for the attachment of the advertisement and then making an excuse for it! As I walked on, I discovered that this combination of a flyer and a poster had been attached to just about every door in my neighborhood—including the door of the building I live in. (It had not been attached to the door a shop selling Catholic paraphernalia, though.) Moreover, the flyer and poster combo for Teemu Laajasalo now appeared on the phone cabinets that had had the ad for Jari Nurmi the day before. The number of ads did not feel reasonable at all. This was way beyond any annoyances during the last parliamentary election campaigns. I thought the apology poster was of bad taste. 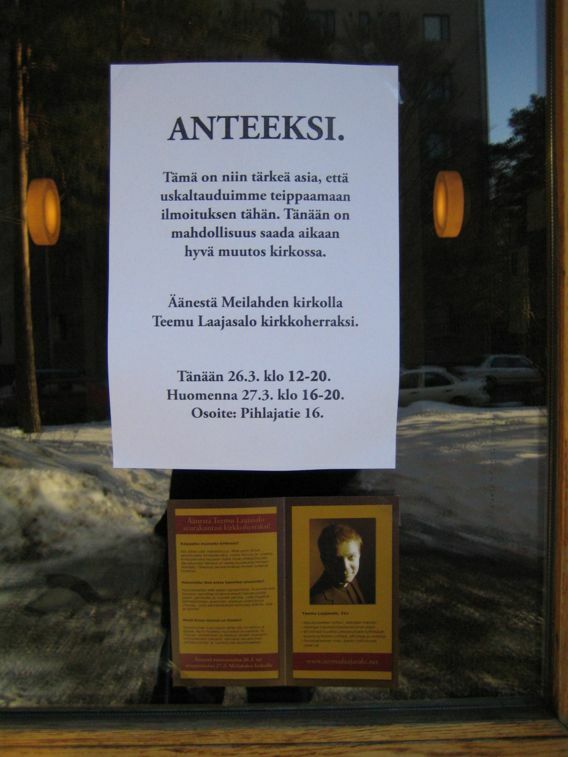 It seemed as if the supporters of Teemu Laajasalo were making a jibe at the supporters of Jari Nurmi for attaching an ads in places where they are prohibited but then doing the same themselves with a vengeance. This matter is so important that we dared to attach this announcement here. Today there is an opportunity to achieve a good change in the church. 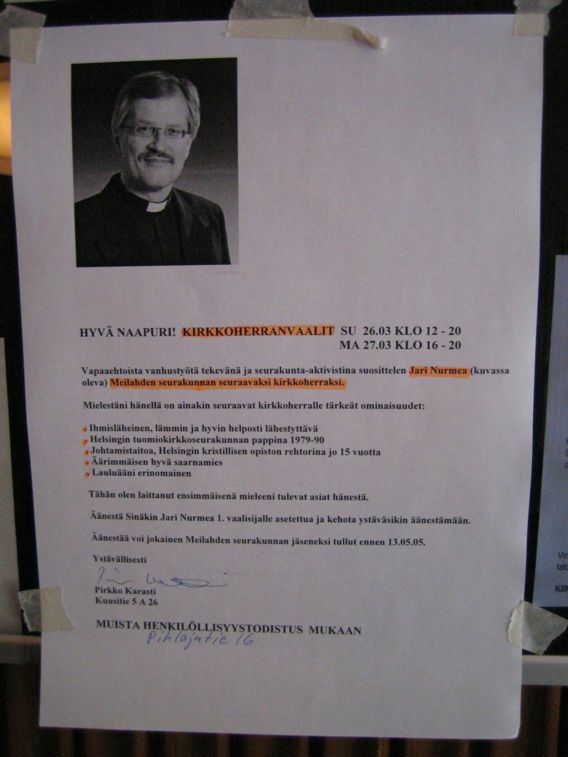 Vote Teemu Laajasalo for vicar at the Meilahti church. Today March 26th at 12-20. Tomorrow March 27th at 16-20. Out of curiosity, I ventured on to Ruskeasuo, the next neighborhood. On the way there, I noticed that new yellow A4-sized posters for Jari Nurmi had been attached next to the Laajasalo flyer and A3 poster. The same thing continued in the next neighborhood, except the posters were obviously from a different batch and had different content. Do I have a Point Buried Down Here? All this raises the question of whether a voter should hold this kind of advertising against the person being advertised. Some people argue against against punishing spammers harshly, because it’s so easy to frame a company by sending spam advertising its product. Could it be that the supporters of these two candidates got carried away and posted all these advertisements without authorization from the candidates themselves? Or could it be that the third candidate was devious enough to commission bad advertising for the other candidates? If the supporters of a candidate do something that you don’t like, is it right to punish the candidate by withdrawing your vote? How can you tell that ads for someone were commissioned by that someone himself instead of being perpetrated by someone else with an intent to generate bad publicity? If what you are advertising is important, do you get to break the rules? In a way it seems unfair to hold a candidate lit responsible for the doings of his supporters. But why should the candidates only get the bright side of having supporters? Sure, if you know one candidate is better on issues than the others, withdrawing your vote because so who the candidate is associated with may not make sense. However, other things being equal to, why wouldn’t you use the fruit the tree bears as a heuristic? The problem of being framed is not actually as bad as it would seem. When someone pretends to be a bank and sends out phishing e-mail, the bank says on its Web site it didn’t send the messages. So if you get framed as advertising in the wrong way, the obvious course of action would be to denounce the ads on your Web site and send supporters to take down the bogus ads. So I Googled for these guys expecting to find campaign sites. (In order to make sure I do not publish this piece if the candidates were indeed framed and were denouncing the ads on their sites.) I didn’t find a campaign or personal site of any candidate. Either these guys were running for office without a Web site or they were seriously lacking Google juice. As for breaking the rules when the issue being advertised is important, I think one shouldn’t. Everyone who advertises something thinks that what ever he happens to be advertising is important. Besides when you advertise in an unwanted way you may get attention but not necessarily positive results. So who won? The third guy who didn’t advertise won. He was also the only candidate who was already employed by the congregation. The two who advertised were from the outside. In the end, the advertising didn’t help in winning the election. It did, however, get attention. For example, I wrote this. Oh and by the way, whoever posted those ads did not take the time to take them down afterwards. I took down a couple from phone cabinets after the election in the interest of avoiding the broken windows effect.